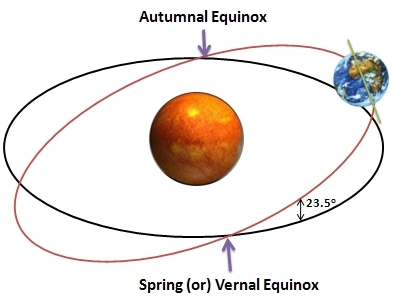 An equinox occurs twice a year, when the tilt of the Earth’s axis is inclined neither away from nor towards the Sun, the Sun being vertically above a point on the Equator. The latitudes +L and -L north and south of the equator experience nights of equal length and the celestial equator has intersected the ecliptic in the axial precession. This year’s autumnal equinox, when the light and dark are equal – but moving towards dark – arrives at 8:54pm Central Time on Saturday, September 22. Let the Fall Celebrations Begin !! This year’s autumnal equinox, when the light and dark are equal – but moving towards dark – arrives at 3:02pm Central Time on Friday, September 22. Let the Fall Celebration Begin ! !